DCplates.net is intended to be a source of historical information on the subject of motor vehicle license plates issued in Washington, D.C. since registration was first required in 1903. This site is not affiliated with the D.C. Dept. of Motor Vehicles or any other government agency. Rather, it is privately supported for the benefit of license plate collectors and others with an interest in the subject matter. This site is based upon a 2003 paper in which details of the multi-year baseplates issued since 1966 were explained. During March and April 2004, this resource was fashioned into seven separate pages, one for each base. A few other pages were prepared in early 2004, after which the project was abandoned until being revived in late December 2005. Following several weeks of work, a period during which a few pages were added and others completed, the site was published on the Web as DCplates.com on January 16, 2006. Its name was changed to DCplates.net on January 8, 2008. 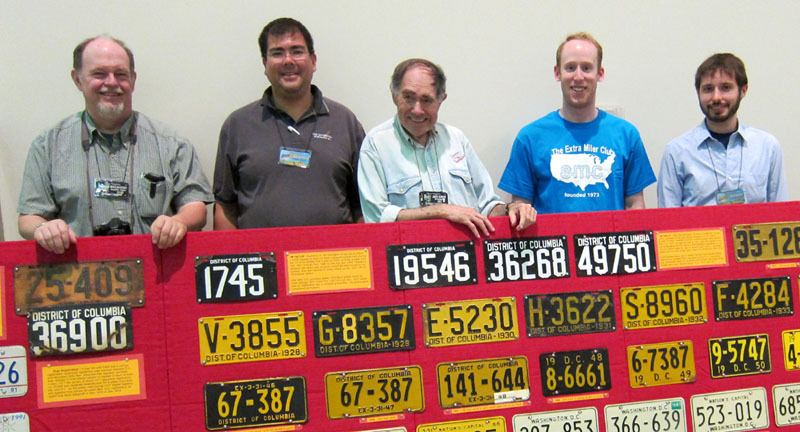 Several regular contributors to DCplates.net assembled at the display of J. Ray Frank at the Auto License Plate Collectors Assn. 2011 internatiional convention. Click here to read about and see additional images of the display. Information about D.C. vehicle registration classifications, DMV forms, literature, and other printed matter. This data may be available to the public or in the form of internal or limited-distribution materials such as legislative documents, DMV procedural manuals, bulletins and promotional literature, etc. Photographs of old and new D.C. plates, both by themselves or while in use on vehicles. Historical images of D.C. plates displayed on motor vehicles. Information about plates assigend to federal officials and agencies, specifically the president, White House, and other high-profile institutions and individuals. Images of D.C. street scenes in which plates are shown in use in their natural environment. Data about non-profit organizations that participate in the District's organizational plate program. To contact DCplates.net via e-mail, click here. To reach us by regular mail, write: Eastern Seaboard Press, P.O. Box 2274, Providence, RI 02905. "120,000 Auto Tags Planned For 1924," The Washington Post June 16, 1923: 1. "1924 City Auto Tags To Be Black and White," The Washington Post May 24, 1923: 2. "2,500 Get Auto Tags," The Washington Post Dec. 1, 1921: 12. "A Few of Washington's Luxury Licenses," The Washington Post Aug. 1, 1909: 8. Balsamo, George, "The 3M Ensure Image Lot Coding System," PLATES Magazine 54, no. 4 (2008): 43. DeGregorio, William A. The Complete Book of U.S. Presidents. New York: Barricade Books, Inc., 1993. Digest of Motor Laws, 71st Edition (2005), Washington, D.C.: AAA Government Relations, 2004. District of Columbia ALPCA Archives. Online document of the Automobile License Plate Collectors Association, 2005. Dragon, Richard E. District of Columbia General-Issue Passenger Car License Plates Issued Since 1966, Warwick, R.I.: published privately by the author, 2003. Elsasser, Glen "Capital's Bicentennial Celebration Is Anything But," Chicago Tribune Dec. 13, 1991. Frank, J. Ray; Garst, John D., Jr.; Gauthier, Charles; and Lackie, Kenneth W., "The District of Columbia, Part II: Special-Event, Vanity, Government, Non-Passenger Plates," ALPCA Newsletter 33, no. 2 (1987): 35. Gauthier, Charles, "The 1989 Presidential Inaugural Plates," ALPCA Newsletter 35, no.3 (1989): 83. Hard, William "National Men and Affairs," The Ogden (Utah) Standard-Examiner Jan. 12, 1930: 8. "Know Your License Letter," American Motorist (District of Columbia Edition) (Sept. 1926): 8-F. Washington, D.C.: AAA, 1926. Leonnig, Carol D. "Duplicate License Plates Uncovered," The Washington Post (Maryland & D.C. Edition) Nov. 8, 2001: B4. Leonnig, Carol D. "Illegal Sale Of D.C. Tags Scrutinized, DMV Says," The Washington Post (Maryland & D.C. Edition) Nov. 14, 2001: B1. "Life of Auto Tag May Be Extended," The Frederick Post March 22, 1923: 1. "New Auto Fee Rule," The Washington Post Jan. 15, 1913. Plummer, Herbert C. (Associated Press) "A Washington Daybook," The Waterloo (Iowa) Evening Courier Jan. 24, 1929: 8. Raiche, Stephen P. "The District of Columbia, Part I: Passenger Plates from 1903 to 'A Capital City'," ALPCA Newsletter 33, no. 1 (1987): 18. Raiche, Stephen P. Nine Decades of Automobile Licensing in the Nation's Capital, A Brief and Concise History, 1903-1994, Washington, D.C.: published privately by the author, 1994. "Ritchie Orders Auto Reciprocity," The Frederick Post Dec. 6, 1923: 1. "Roosevelt's Auto License is Number 100," The Oakland (Cal.) Tribune Feb. 5, 1934. Tanner, Eric N. Notebook of Information on Passenger License Plates of the United States and Canada, Grand Rapids, Mich.: published privately by the author, 2005. Taylor, Eric Robert Porcelain Plates.net District of Columbia Archive accessed Nov. 2, 2008. "Washington Yesterday and To-Day, Automobile Development," The Washington Post Oct. 7, 1909: 6.